If you are looking to find the answers to these questions above, then read on. Keep the chimps happy by looking after your coffees- wine them, dine them and romance them. Your coffee that is- not the chimps. Although if you fancy a furry companion, the chimps might be for you! Treat your coffee as a romantic partner. Ooh, La La! Look after them well, give them attention at least once a day and buy them little gifts every now and again- like a new device. We have put together a few Do’s and Don’ts of how to keep coffee fresh to ensure that you have the yummiest tasting coffee to fuel your day! Do store your coffee somewhere cool- cool in temperature rather than totally awesome cool! Don’t store your coffee in the fridge. Changes in temperature can create unwanted moisture in your coffee and will upset the flavours and freshness! Do keep your coffee out of direct sunlight as it can modify the taste and even appearance of your yummy coffee. Don’t leave your coffee bag/tin open. Although oxygen is good for most things, it is not good for coffee. When it comes to coffee, the air is a burglar; it always takes the freshness, taste and smells away from coffee- and without asking too! How rude! Do keep it in an airtight container- this might be a bag or tin. Whichever it is, try to remember to close it after grabbing your coffee. Don’t order too much. Although sometimes it can work out more cost effective to order a whole truckload of coffee to keep you going for months, it may not be the best way. Coffee loses its freshness and aromatics after time and therefore will not taste as great as it did three weeks earlier. Do order little and often! Perhaps order smaller bags but every two weeks to make sure that you always have fresh, tasty coffee to serve the gas man! Feel free to check out our freshly roasted coffee subscriptions to read more about coffee tailored just for you! That’s it- It’s easy to keep coffee fresh. 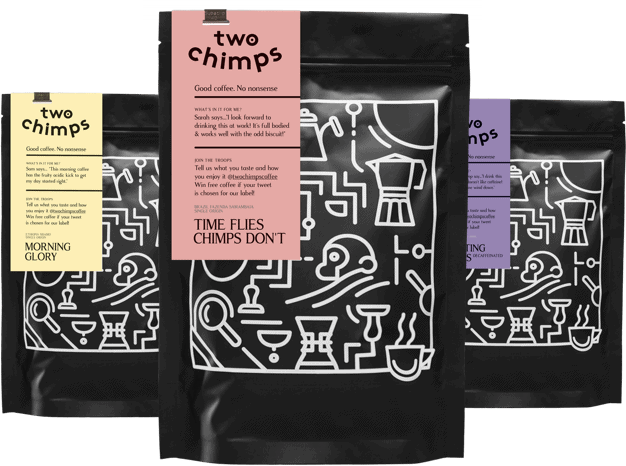 Order little and often and keep it in your handy coffee storage tin or resealable coffee bag- Chimptastic!